The book you’ve all been waiting for! 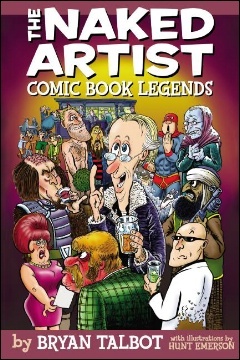 COMIC BOOK LEGENDS is an outrageous collection of the unreported exploits of comic creators, the stories only usually told late at night between the hallowed walls of convention pro bars! EISNER AWARD WINNER Bryan Talbot brings you the anecdotes, funny, shocking and downright weird, told about your favorite comic writers and artists, from Simon Bisley to Neil Gaiman, from Grant Morrison to Jeff Smith! Number 360 Sing along with Syr-Darya! Bill West in Owlhoots in the Sky! A Pain ins the Ads Wednesday advertising day.